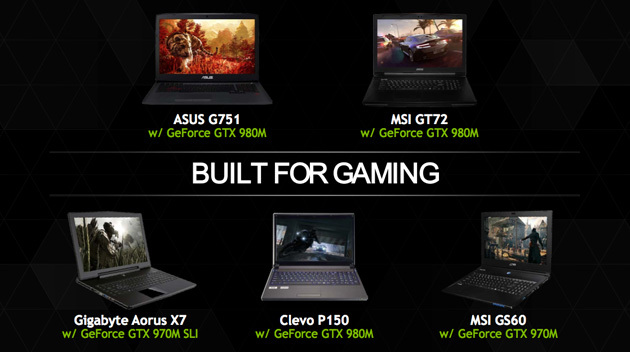 I wanted to give a heads-up and show off some of the performance benefits we're going to be seeing as the 9xx Nvidia M series GPUs filter through to the lineup of MSI's gaming notebooks. The NDA is still in force today, but we're releasing a teaser of the kind of upgrade we'll be seeing - and it's huge. Alright so here's the first teaser of the 9 series mobile GPU performance running in the GT72. The current gtx870m GT72 2PCE Dominator scores a bit over 7000 in 3dmark - which is a real powerhouse for a gaming laptop. Over 11000... And for those who already have a GT72, you'll be able to swap out the graphics cards just as easily as changing a PC GPU. Tomshardware has the first scoop on the release of Maxwell for mobile, and it's an enormous increase. I'm seeing something like a 50% across the board improvement from 870-970m here. And of course everyone's gaming notebooks are going to be refreshed across the coming month. Exciting times. We’ve been getting requests for upgrade videos lately, so we decided we should give it a try. The most popular models to upgrade are probably the GE60/70, in which you can quite easily replace the RAM, HDD, SSDs as well as the WiFi/Bluetooth card. In case you were curious on how to upgrade your GE before, you no longer have to be. We take you through the steps over a 10-minute video on Youtube. Last edited by jasong; 01-12-2014 at 08:24 PM. We often focus on higher-end material when we present our technical articles, but as Christmas nears, we’re getting a bit lazy. Instead, we produce things like in-game videos of Far Cry 4 on those high-end machines, but we also have Elder Scrolls Online bundled in lots of regions around the world. ESO runs just fine with quite high settings even on lower spec machines, such as the GE60 with the modest GTX 850M. We had a little game session at the office, averaging over 60 FPS in the Wailing Prison, while hitting way over 30 FPS when we got out of the prison, into the more demanding scenery. Being an online-only game, we can’t run any benchmarks, but even our lower-end offerings will run ESO without any sign of trouble, in case you are interested in picking up a G series with the free game and 30-day subscription. Stay tuned for our in-game video of Elder Scrolls Online – we promise it’ll be played as badly as the Far Cry 4 one. Super RAID 3 is MSI’s name for a 4-SSD RAID 0 solution used in the GT72. You may know that traditional mechanical hard drives are going out of fashion like… Uhh, I don’t know fashion, but their only upsides have been storage density as well as price. Until very recently, that is, now SSDs have actually surpassed hard drives in storage density on 2.5” drives. Also, SSD controller manufacturer Phison, claims that SSDs will basically replace traditional hard drives in notebooks as soon as 2015 or 2016. The future, therefore is SSDs. While we have absolutely no doubt that our Super RAID solution is the ultimate, we want to demonstrate to you exactly how massive the gap is. With the help of benchmarks, obviously, and an unfair one at that. What we did, was find a GE40 with a relic of a mechanical hard drive in it. A 7200 RPM one, so not the slowest we could find – and compared it to the GT72 Dragon Edition and its Super RAID 3 solution of 4 256GB SSDs in Crystal Diskmark. Extreme differences? You bet. A typical hard drive result – easily surpassed by even USB 3.0 memory nowadays. Peaks of just over 60MB in sequential read and nearly grinding to a standstill in the 4K tests. Super RAID 3 though – it monsters the HDD (and, to be fair, everything else on the market). Not surprisingly, exactly, but with 1.5GB/s (not Gb, GB, Gigabyte) sequential read speed it is what you call fast. Windows 8 loads quickly with one SSD, but with four in RAID0, you’re barely given time to blink. Best of all, with a 4x256GB SSD, there’s plenty of room for your games on the RAID array, meaning you can always be the first onto the battlefield in games, as your maps will load so much faster than the opposition’s.